Good morning and Happy Friday! Today I will be sharing one of my recipe revamps with you. I made two of my older recipes again and took new photos. 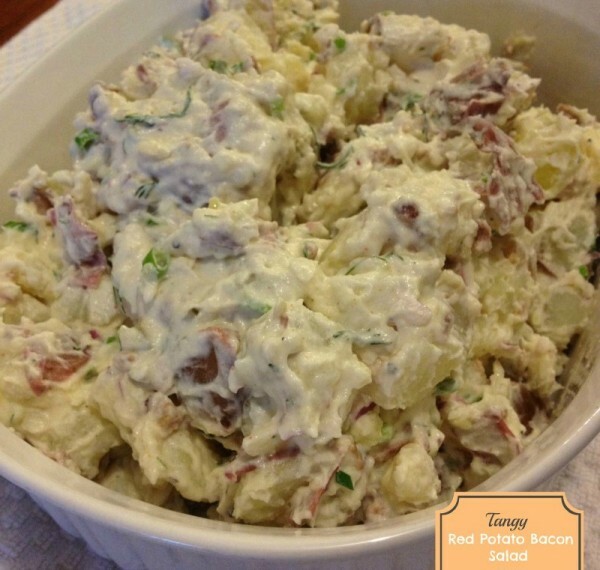 Below you will find one of them, Tangy Red Potato Bacon Salad, with before and after photos. How was your week? Mine was pretty crazy. I flew to Atlanta Monday evening. Although the flight was smooth, I was not thrilled with it. I do not like flying. I was very anxious to catch the returning flight home. Seriously, I studied the flight of the flight I was scheduled to take home, checking how often it was delayed or cancelled. I found that it was delayed often. My supervisor was with me for this trip and noticed how anxious I was to fly home, and how anxious I was on the flight to Atlanta. We looked at some rental car prices and decided to rent a car. I would drive 8 hours to get home. I am so glad I did because it turns out our flight was delayed until 11:30pm last night. I would not have made it home until probably 1:30am had I waited around for the flight. Since training got our early and we left Atlanta at 1:30pm yesterday, I actually made it home before my flight even left Atlanta. I got home around 9:15pm. The area of Georgia I was in, Norcross, which is just north of Atlanta, is BEAUTIFUL! There were a lot of hills, beautiful trees (some of them even looked like Christmas trees) and the grass was lovely. Yes, I couldn’t get over how nice the grass was and all of the hills. We don’t really have hills in Florida. And we don’t have trees that look like Christmas trees. I’d definitely like to visit the area again. If I do, the trip will be a total road trip. No flying involved! Now let’s get to the recipe revamps! I first made this recipe last summer. I decided to make it again a few weeks ago. When taking the initial photos when I made it last year, I used my iphone camera and didn’t put much thought into the composition of the photos. Doesn’t the photo look well, horrible? You wouldn’t want to eat that, would you? Let’s take a look at another one of the new photos. 100% better, right? I shot this photo in RAW, did some editing in Photoshop Elements and voila. A lovely photo that actually makes you want to dig right in! 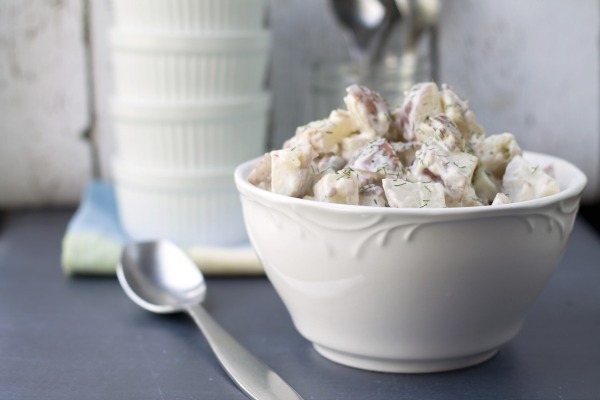 If you want to check out the Tangy Red Potato Bacon Salad Recipe, you can right here. What are some of the things you’ve done to improve your photography skills? I need to make it back down that way…sounds gorgeous! I don’t care for flying, maybe I’d just take a road trip. Although, it’ll take me 3 days to get out there! I’m loving this recipe how you put the yogurt in it. 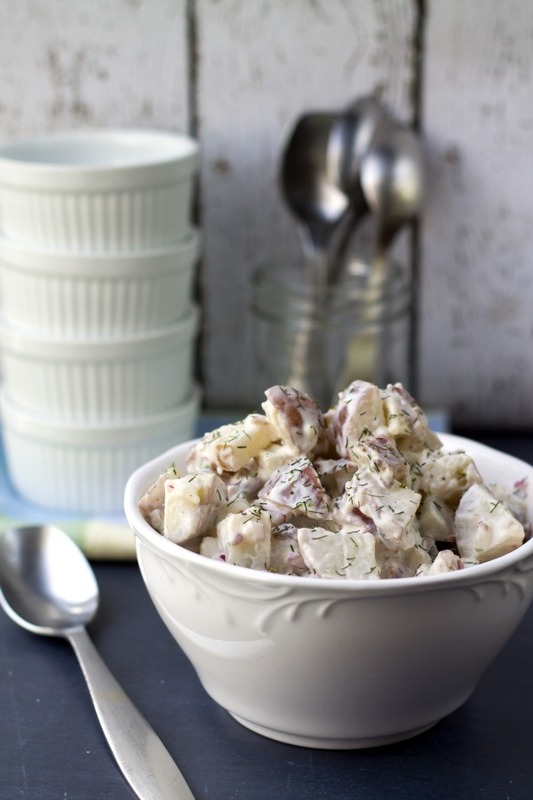 I love putting dill and bacon in potato salads, too! I am seriously going to have to try this recipe. I love a good twist on potato salad! Thanks for sharing. Oh wow! I love this post and seeing the new photos. Your photos are great now and it is nice to see improvement I bet. I can’t wait to get a DSLR camera as well and improve my photography. Wow!! Julie, that click nearly rocked me!! The new picture is a stunner!! Ah! so we both have one thing in common….flying…I hate flying, and try to make excuse for not flying….road trips are more fun!! omgawd i love it and will try it this weekend with turkey bacon :-D going to go grab that recipe now. i have not been on a plain since 1987. because of it i’ve avoided two paid for trips because i’d have to get on a plane. i can’t imagine how freaked out i would be to be on one. I’m glad you made it home safely, Julie! I went to Atlanta several weeks ago to visit my college buddies. I went to Emory University and used to work for The Weather Channel so I’m very familiar with Atlanta and all the suburbs. I must agree. Norcross truly is a beautiful place! When I look at my photos from last year, I cringe…I’m really trying to work on my food composition. I really want to tell a story and create a sense of movement in the picture. I always shoot from the same angle and it would be fun to explore other options. However, I’m kinda scared to try something new. Your new photo is gorgeous!!! I love some potato salad. Especially with BACON!!! Thank you, Heather! Potatoes and bacon just go together, right?! Hi Julie, You’ve come a long way baby! Gorgeous picture!! You’ve got me thinking about doing some before/current shots. Hope you are having a good weekend…. Pinned! LOVE your photos Julie!!! Makes me want to take a big spoon and dig right in. Looks delicious! Pinning! :) Have a great week. As a photographer, if you want your photos to look amazing it’s all about the lighting (creating shadows with lighting from the side). You don’t need an expensive camera or need to shoot in RAW (which is only needed for extremely large printed photos). Get a sync cord for your flash and move it to the side with a reflector on the other side of the subject, or even better shoot your flash through a light box which will soften the light. So, where is the recipe? I could care less about pretty pictures. I’m not sure why the site who shared this recipe didn’t share the original post but it is what it is. I hope you enjoy the recipe!